This NASA site provides information about white dwarfs, produced when stars like our Sun exhaust their nuclear fuel and blow off much of their mass. The site contains an explanation of the composition of white dwarf stars and the processes that create their immense density. Additional links include an online quiz, cool facts, frequently asked questions, and other resources. (Goddard Space Flight Center, Greenbelt), WWW Document, (http://imagine.gsfc.nasa.gov/science/objects/dwarfs2.html). 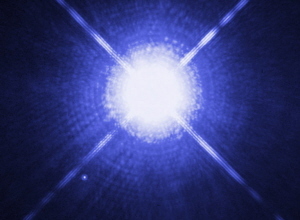 White Dwarf Stars, (Goddard Space Flight Center, Greenbelt), <http://imagine.gsfc.nasa.gov/science/objects/dwarfs2.html>. Goddard Space Flight Center. White Dwarf Stars. Greenbelt: Goddard Space Flight Center, November 1, 2006. http://imagine.gsfc.nasa.gov/science/objects/dwarfs2.html (accessed 22 April 2019). White Dwarf Stars. Greenbelt: Goddard Space Flight Center. 1 Nov. 2006. 22 Apr. 2019 <http://imagine.gsfc.nasa.gov/science/objects/dwarfs2.html>.